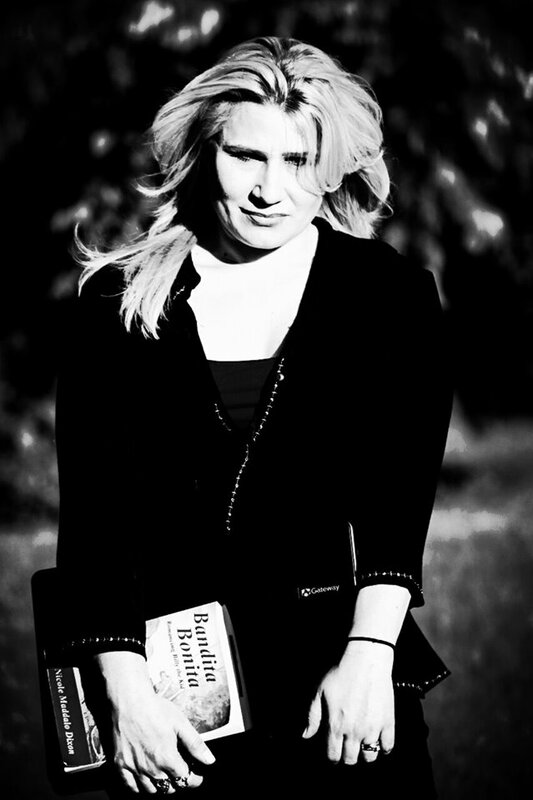 Nicole Maddalo Dixon published her first book Bandita Bonita: Romancing Billy the Kid in December 2013. I was always been lover of westerns, so this book is kind of reminder for my child years. I never stop wondering why cowboys, Indians, gold miners are almost forgotten in the current literature. Well, I am stopping with my nostalgia talks, because here is the interview with lady Nicole Maddalo Dixon. 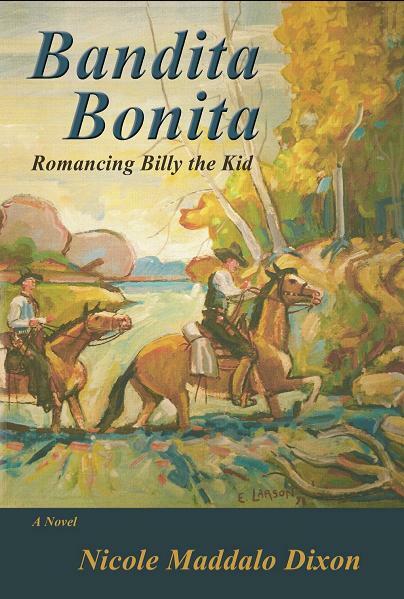 – What is your book Bandita Bonita: Romancing Billy the Kid about? – Bandita takes place in 1877 New Mexico and is the story of a young New York heiress, Lucy, who is sent out west to marry her pre-contracted fiancé during the volatile days that lead up to what eventually breaks out as the infamous, bloody Lincoln County War in Lincoln County, NM. Desperately inconsolable at the prospect of marriage to a man she does not love, she becomes close to and falls in love with a hired farmhand, William H. Bonney, who will soon become known to history as the notorious Billy the Kid. Lucy’s fiancé is murdered in cold blood by his competitors, the Santa Fe Ring—a move that sparks the infamous war—and Lucy’s life is then in jeopardy as she is next on their list. She is then placed under the protection of the deputized Lincoln County Regulators and is forced to ride the trails with Billy and the boys, becoming a witness to the bloody battles that occur. During this trial, Lucy uses the war to her advantage as her own personal battle to win freedom from a life that is oppressive. – I have always been fascinated by Billy the Kid and the kind of person he was. After my years of research I finally decided that I wanted to contribute to his legacy by helping to perpetuate the truth of what happened and who the Kid really was despite myth and legend. I thought I might tell it in a unique way that would appeal to a broader demographic, and therefore decided to write it as historical fiction while keeping the names, accounts, and events accurate. – Fortunately, the only challenges I have and do encounter are keeping the facts as accurate as possible. This presents a challenge only because it involves having to interrupt my writing flow in order to suitably double and triple check information before committing to writing it down responsibly. Other than that, writing the story is an absolute pleasure. It’s very cathartic and exhilarating for me to spin my version of the tale. – Tell us something more about your main character? What is the difference with the real Billy the Kid? – My main character, Lucy, is a brat, but charmingly so. She has a brilliant sense of humor that is sometimes acerbic, but always fun to play around with. She’s truly a strong-willed female during a time when women did not have many options. She and the character I’ve created for Billy play off of one another nicely, as I am able to create a composite of who I think Billy may have been based on accurate witness accounts. I’ve tried to maintain a total sense of truthfulness in regard to Billy’s personality according to the several accounts that have been documented by reputable sources. – Why you decide to write a Western? – I have always been partial to westerns. I love the sense of freedom that always accompanies such stories, but in this particular case and in wanting to write about Billy, I hadn’t much of a choice but to stick to that particular genre. – How much time do you need to finish the story and to publish it? – I wrote the first book in 3.5 months, but that was after having thought about it and mulling it over in my mind for 3 years prior. At present Book II is nearly complete as I am in the process of giving it the required, solid edit before I hand it over to my publisher. – I am a visionary—a creative thinker. I love to learn no matter how insignificant the topic may seem to others. All information is valuable to me, and that is paramount to a writer—finding value even in the mundane. – When the dialogue/narration comes, I write it down. I have to, as do most writers. I am always able to sit down and write at will, but there are times when I am doing something else and the words just hit me. When the words beckon I respond, and that includes when I find myself exhausted and trying to sleep. I have to forgot the pleasantness of lying there blissfully in order to grab a pen and paper, or even my laptop, to get those words down. – Are you satisfied by the sales of the book and do you plan another one? – Bandita has only just launched as of last December (2013), and so reflecting on book sales at present would be premature. However, that said, I do feel that sales are right on course in conjunction with my promotion of the material and its only having just relatively launched. As I have mentioned Book II is on deck, and I am planning a Book III & IV, the latter of which I plan to have stand on its own merit despite being a part of the original story/series. – What are you doing to promote by the best possible way your book? – I’m doing the usual; blogging, tweeting, posting, and making some rounds on the blog talk radio circuit, along with scheduling book signings and appearances at book clubs. Essentially, I am taking full advantage of social media, as any entrepreneur should do, and networking as often as I can by using both electronic and organic mediums. – Do you think that the man from Western times is more honest and real man then current one? – That is a difficult question to answer because one would have to compare the environment of the Wild West with today’s civilized west. It’s really on par with apples and oranges. I believe that there is probably the same total of honest v. dishonest men, respectably. – Who is your favorite Western character and why? – William H. Bonney (aka, Billy the Kid) of course. He’s one of the few romantic, tragic characters of the old west who literally has earned his legend. Until fairly recent years, Billy was often suggested to be a sociopathic, cold-blooded killer, but that was just not true. He was a level-headed, clever leader who was kind and respectful, but who fought back (as any might) when backed into a corner. He was a vivacious individual who loved to dance, laugh, and romance the pretty girls. He truly was a daring, romantic individual!